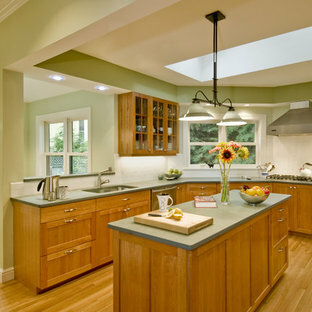 Kitchen remodel in Oak Park. 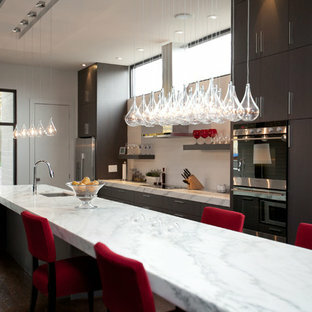 TZS Design collaborated on this kitchen design with L'Armadio cabinetry and we are thrilled with results. This large kitchen incorporate state of the art appliances with energy efficient LED and compact fluorescent light fixtures. 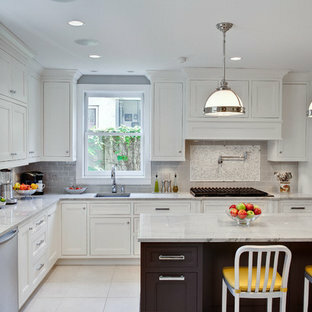 The cabinetry is all custom designed finished in painted maple with durable quartzite counter tops. 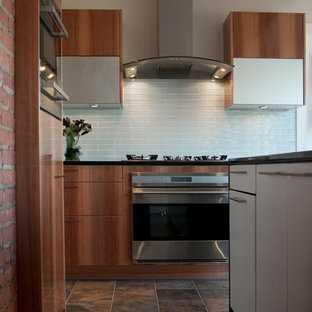 Marble accent tile is displayed behind the range with grey ceramic subway tile for a hint of contrast. 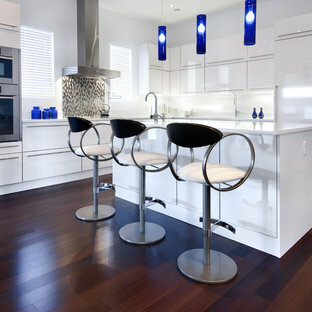 The floor is durable color body porcelain in large format to minimize grout joints. A TV is cleverly hidden behind a wall cabinet with entertainment style doors. Custom drawer inserts were designed to provide more efficient access to spices and other kitchen related items. 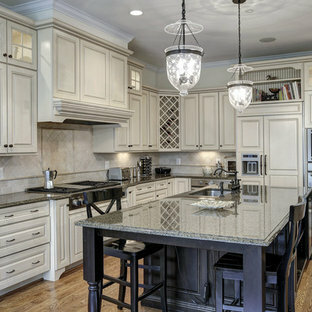 Please give us a call for your next kitchen remodel and we will create just the right custom kitchen for you. Por Charlie Allen Renovations, Inc. The kitchen in this 1870s home had been designed to resemble the galley of a Scandinavian boat: a fun design choice, but one that resulted in a cramped and dark workspace for the homeowner. 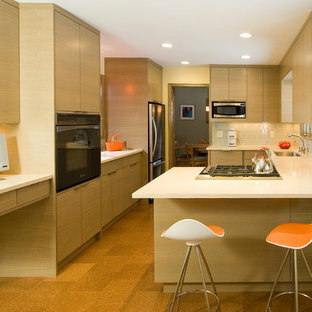 Maintaining the room's original footprint, the space was fully renovated to open up the kitchen. 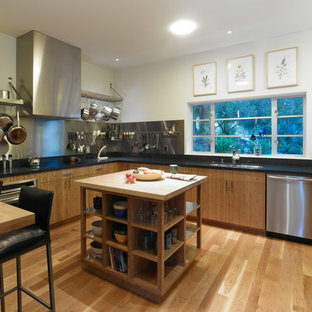 Cabinets were taken down from the walls, with storage placed beneath the countertop instead, freeing space for additional windows and allowing clear sightlines to an adjacent breakfast nook. Workstations and appliances were also relocated to create a more comfortable working environment and to improve flow within the room. 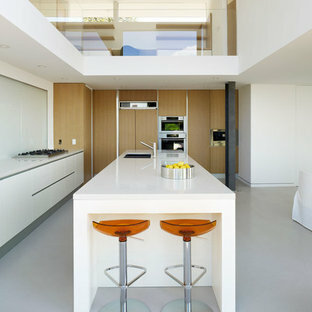 White high-gloss doors with aluminum edge-banding and perfect white counters with stainless steel accents and appliances set up a divine backdrop for a splash of colour that makes this kitchen attune to its ultra-modern, sleek design. Some of the indulgences hidden behind this kitchen's shiny exterior include a hands free waste sorting system, Blum Tandembox intivo drawers with softclose and a walk-in pantry with a Miele coffeemaker and microwave. 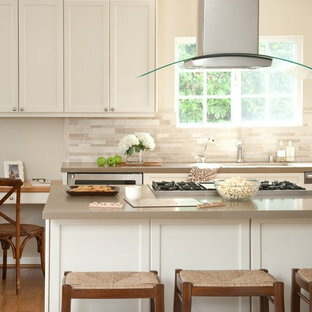 Fully integrated Miele appliances, an induction cooktop, a boiling water faucet, and an additional island sink complete this kitchen's functionality. Por Cody Anderson Wasney Architects, Inc.
As the clouds change color and are in constant motion along the coastline, the house and its materials were thought of as a canvas to be manipulated by the sky. 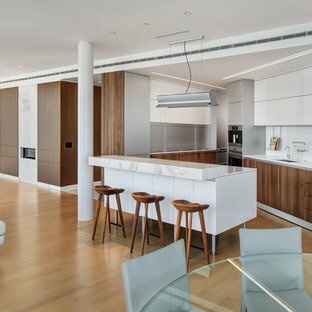 The house is neutral while the exterior environment animates the interior spaces.